Brussels, Belgium, 2013-12-16 — /travelprnews.com/ — The Radisson Royal Hotel, Moscow has been awarded as the World’s Leading Luxury Business Hotel 2013 for the fourth year running at the glittering World Travel Awards ceremony held on 30 October 2013 in Doha, Qatar. According to the votes of the expert jury, consisting of 200 leading tour operators and industry professionals, Radisson Royal Hotel, Moscow (historical name “Hotel “Ukraina”) again proved its right to hold the leading position among the best hotels worldwide. Now in its 10th year, the World Travel Awards is renowned as one of the premier accolades in the travel and tourism industry. The 2013 World Travel Awards Grand Final was hosted at La Cigale Hotel in Doha, where the industry elite – including CEOs of leading travel companies, government ministers and tourism board chiefs – travelled from around the globe to join guests of honour HE Sheikha Al Mayassa bint Hamad al-Thani, chairperson of Qatar Museums Authority and Sheikh Jassim bin Abdulaziz al-Thani to celebrate the very best of travel and tourism brands. 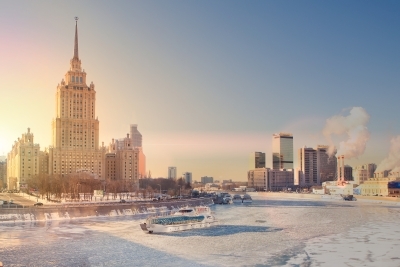 The Radisson Royal Hotel, Moscow, an impressive building with a height of 206 metres and a total surface of more than 100,000 square metres, is one of Stalin’s legendary “Seven Sisters” skyscrapers. It is located in the city centre – on a bow of the Moskva River at the junction of Kutuzovsky Prospect and Novy Arbat, two of the city’s most prestigious commercial thoroughfares. The 506 rooms and suites (25-370 sqm), and the 38 serviced apartments (70-120 sqm) with kitchenettes, all feature Radisson Blu signature services such as free high-speed Internet access, and are equipped with furniture and accessories from worldwide leading brands including Baker, Provasi, Florence Art, Citterio, Villeroy & Boch, Penhaligon’s and Etro. The Rezidor Hotel Group is one of the most dynamic hotel companies in the world and a member of the Carlson Rezidor Hotel Group. The group features a portfolio of more than 430 hotels in operation and under development with more than 95,000 rooms in more than 70 countries. Rezidor operates the core brands Radisson Blu and Park Inn by Radisson in Europe, the Middle East and Africa (EMEA), along with the Club Carlson loyalty programme for frequent hotel guests. Rezidor has an industry-leading Responsible Business Programme and was awarded one the World’s Most Ethical Companies by the US think tank Ethisphere In November 2006, Rezidor was listed on the Stockholm Stock Exchange. Carlson, a privately held global hospitality and travel company, based in Minneapolis (USA), is the majority shareholder. This entry was posted in Hospitality, Hotels, Luxury, Resorts, SPAs & Wellness, Travel Awards, Travel Marketing and tagged Doha, moscow, Qatar, Russia, The Radisson Royal Hotel, World Travel Awards, World’s Leading Luxury Business Hotel 2013. Bookmark the permalink.